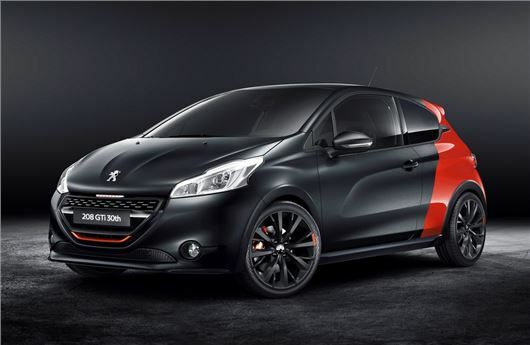 Peugeot has unveiled the 208 GTi 30th as it celebrates 30 years of the Peugeot GTi which began with the famous 205 GTi in 1984. The 208 GTi 30th will go on sale this November although no prices have been announced yet. Along with a bold two-tone paint job, the 208 GTi 30th gets an uprated version of the 1.6 THP engine with 208PS and 300Nm of torque along 10mm lower suspension and a wider track. Acceleration from 0-62mph takes 6.5 seconds - 0.3 seconds quicker than the standard 208 GTi. Other changes include bigger 18-inch alloy wheels with matt black rims and a Torsen differential taken from the Peugeot RCZ. Both the ESP and traction control have been recalibrated, to be less intrusive and the steering has been revised to give more precision. As well as that optional two-tone paint job, the 208 GTi 30th is available in a more subtle Pearl White or Ruby Red. Matt black detailing on the grille and door mirrors along with matt black side skirts helps differentiate this from the standard 208 GTi whille inside it gets front bucket seats finished in Alcantara with red stitching.